This figure from the USGS West Lake Landfill groundwater report shows levels of radium in groundwater wells under and around the landfill. Red, orange, and yellow dots show radium contamination above the federal safe drinking water standard. It further described methods it is developing to determine what might happen if an underground fire smoldering at the nearby Bridgeton Landfill were to spread to reach the World War II-era nuclear weapons waste stored at West Lake Landfill. 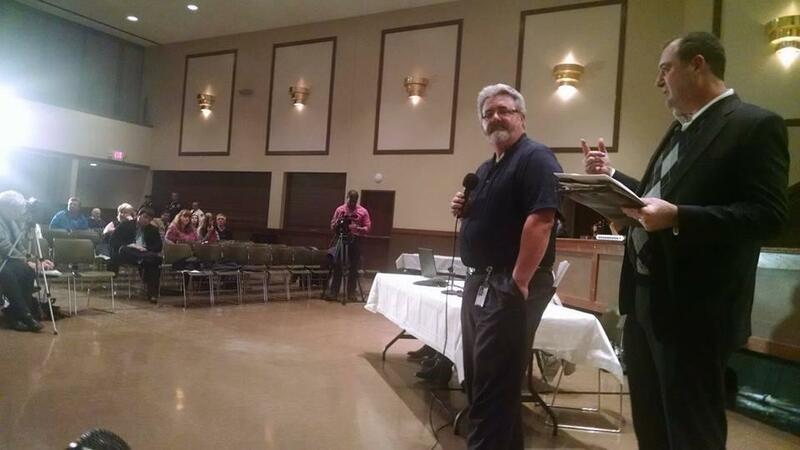 The EPA's Brad Vann (center) and the Community Advisory Group chair Doug Clemens answer residents' questions Monday night about additional testing and the agency's focus on groundwater contamination. Currently, the EPA oversees the remediation of the two areas, or operable units, at the West Lake Landfill Superfund site. After first considering the idea a year ago, the EPA now wants to add a third operable unit, or OU3, to study radiological levels in groundwater under the site. That investigation would conclude with a clean-up plan to be paid for by the “potentially responsible parties,” including landfill owner Republic Services and the Cotter Corporation, said Brad Vann, remedial project manager for the EPA Region 7. 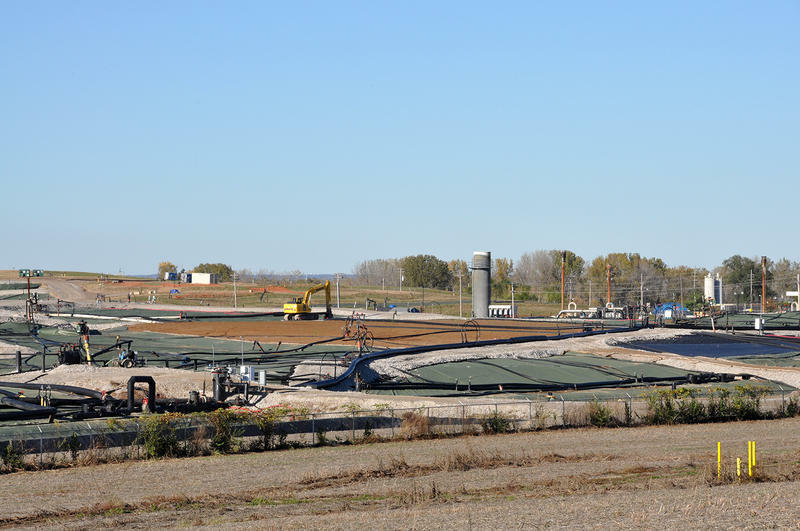 Vann said previous studies showed higher than acceptable levels of radium in the groundwater within the site, but earlier data couldn’t determine how much of that leachate came from typical landfill waste, naturally occurring radium or from the radiological waste. “We’re going to try to launch that this year, along with everything else we’re doing, and then there will be an RI – a remedial investigation – and a feasibility study will follow, and then its own 'record of decision,’” Vann said. Representatives from the Agency for Toxic Substances and Disease Registry assured residents at an October meeting that any groundwater contamination would not affect human health because no nearby private wells were being used primarily for drinking. Monday's announcement was welcome news to many residents. “We’re actually excited that the EPA is going to look into it,” he said. The announcement also comes shortly after the U.S. Senate passed a bipartisan bill that would transfer the authority over remediation from the EPA to the Army Corps of Engineers. Missouri’s Congressional delegation and many residents have called for such a change, saying the EPA has long delayed implementing clean-up. The bill now goes to the House. The EPA will also take soil samples of sediment around the site “specifically in response” to flooding throughout the St. Louis region prior to New Year’s. Even though Vann said there was “clearly runoff from the site," the EPA doesn’t believe that included sediment from landfill areas with nuclear waste. Still, Vann said sediment samples hadn’t been taken in a number of years, and the Missouri Department of Natural Resources was concerned that sediment near radiological materials needed testing. As a result, Vann said the agency will collect and analyze samples from several sites and locations tested by the Department of Natural Resources back in November. 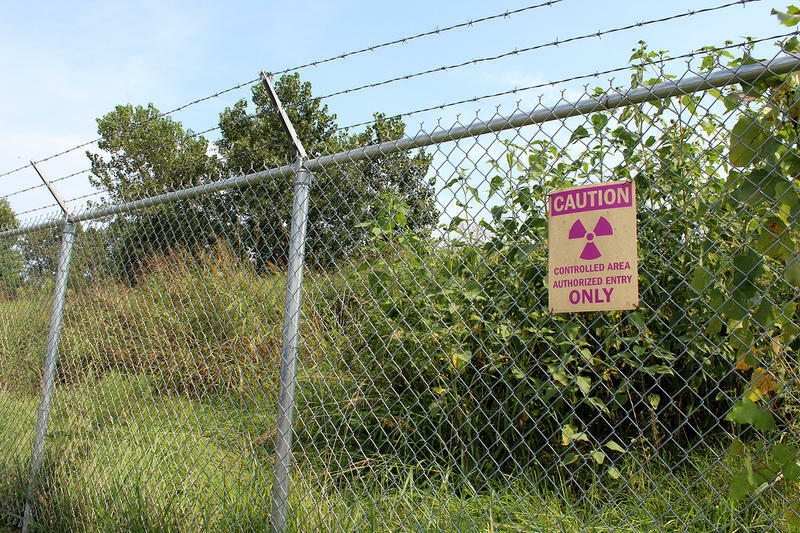 That includes two spots on the nebulous border of the landfill and two private businesses, in what’s considered a buffer zone, where the MDNR’s preliminary report released last month found radiological material. Vann said the EPA will also test drainage ditches. “If there was going to be runoff from areas one and two, we’d find sediment there,” he said. Potentially contaminated runoff was an issue for the members of the CAG. Despite the promise of more testing, some residents at the meeting said the EPA is still not doing enough. Tonya Mason of Spanish Village said the EPA should conduct testing in a grid pattern, rather than a “step-out method” – moving outward from an area known to contain radiological material until none is found. “You can’t find it unless you test,” she said. Vann said the EPA has used an “overlay grid” to sample at the two areas at West Lake Landfill in the past. But Mason said she was concerned that no testing had been done on soil from Bridgeton Landfill’s south quarry, with its underground fire. “If it’s currently burning, why wouldn’t you test it? To me, as a resident, I feel like you’re afraid of the answer,” she said. But Vann said the history of the site and other analyses, including testing air samples above the quarry for gamma radiation, have indicated there’s no radioactive material there. Mason also questioned the EPA’s plan for an isolation barrier, officially announced in December, to prevent the underground smoldering from reaching radiologically impacted material (RIM). “What are you barrier-ing it from? Because if the RIM is already where there is fire, then the barrier means nothing,” she said. Vann said the EPA plans to go ahead with requiring the fire break be built. But he said the EPA is testing to see what happens to radioactive samples from the landfill site at increasingly high temperatures, of up to 482 degrees F. He said that’s hotter than temperatures recorded near the smolder. “What happens? Does it give off gas? Change phase - does it move from a solid phase to gaseous (or) liquid?” he said. So far, only a solid phase testing has begun; Vann said liquid and gas tests are being developed. Meanwhile, Vann said the EPA is also working to get those responsible for the landfill to deploy a “noncombustible cover” on the areas with surface-level radiological material. Last December, the EPA first announced plans to remove vegetation from radioactive areas of the West Lake Landfill and other measures to prevent surface fires. That’s because a small fire broke out last fall on the surface of West Lake Landfill. The incident sparked concerns from first responders and residents about the possibility of a ground fire reaching contaminated soil. Vann said brush will be cleared, chipped on site, and buried before affected areas are covered with matting. He said surface-level gamma scans will also look for spots that might have been missed in previous testing. Vann said the cover will not only help reduce surface fires, but also prevent contaminated soil from washing away in the event of future flooding. It will also stop wind from blowing away radioactive surface soil. November’s MDNR interim report had found one radiological dust sample in that buffer zone on the boundary of the landfill. The U.S. Environmental Protection Agency is ordering those responsible for the West Lake landfill to clear brush and provide fire-proof cover for areas contaminated by radioactive waste. The order comes after an October brush fire at the entrance to the north St. Louis County landfill raised concerns about the consequences of a surface fire reaching radioactive waste at West Lake. Who are the players in the West Lake and Bridgeton landfill sagas? In the mid-1960s, trucks carrying radioactive waste left over from World War II began lumbering along the then-dirt road leading to what’s now the West Lake landfill. The waste was moved to the site — then deemed remote enough from humans — over more than a decade. Federal authorities denied that the yellow “dirt” contained radioactive radium and uranium. Even the truck drivers — some of whom later died of cancer — didn’t know what they were transporting for years.